Sam Pulls a Fast One: Car Tax Not on City Council Agenda Tomorrow. He promised it would be referred to a ballot for your vote at the Feb 27th meeting. Here’s the agenda. It’s not there. **UPDATE**There IS resolution on the agenda for the City Council to back him up on whatever he decides to do about it LATER. He said it would be a resolution or referral TO THE BALLOT. Not a STUDY. Please. He’s buying time and hiding behind his so called “Stakeholder” Committee. One of the "101 Most Dangerous Professors" Headed for PSU? That’s what we hear. PSU won’t confirm. Groups on campus, including the Jewish student groups and the Campus Republicans, have caught wind of one of the biggest American hating, terrorist loving professors around hanging out his shingle at the Middle East Studies Center. Joel Beinin is so notorious that a student run paper used to print a “Beinin Watch” to keep up with his antics in the classroom. Below is a letter I drafted to the Trustees and here are their names and addresses. I am writing to express my concern about the apparent imminent hiring of Professor Joel Beinin to oversee the Portland State University Department of Middle Eastern Studies. Portland State officials have not returned calls or responded to my inquiries about Beinin’s future with PSU. While I understand that Professor Beinin’s scholarship is the subject of criticism, it’s his hatred of America, Jews, and apology for known terrorist groups that have perpetrated violence against the United States that gives me cause for concern. I appreciate intellectual diversity, but I must say it seems that Portland State University has caught its limit of leftist, America hating professors. Can’t there be some intellectual balance applied to the hiring process? Would it be too much to hire professors who actually like this country and not spend classroom time fomenting hatred for it among the students? I’d appreciate hearing back from you. What’s Worse: Banning Crucifixes from an Albany School or Using Crucifixes as Gang Symbols? ALBANY — A pair of Albany teenagers suspended for “gang-related behavior” because they were wearing crucifixes say they were only wearing gifts from their mothers. 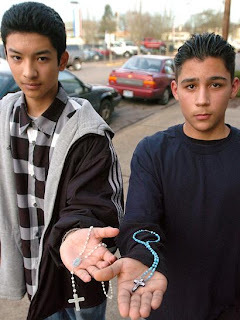 Jaime Salazar, 14, and his friend Marco Castro, 16, were suspended from South Albany High School recently after they refused to put away the crucifixes they were wearing around their necks. Castro, a junior, was suspended for three days after refusing to take off a string of milky rosary beads, with a crucifix and a tiny picture of the Virgin Mary, that he was wearing around his neck. His mother gave it to him, he said. Is it the Same if Hillary Puts on Her Forebears’ Attire? Question: If you’re a US Senator and visiting Kenya, the land of your father’s people, why do you dress as a Somali elder? If you’re a US Senator don’t you think about the Somali elders who, working with Al Qaeda, ordered the attack on American Rangers and Seal Team 6 in Mogadishu in 1993? From Gateway Pundit we find THIS picture of Barrack Hussein Obama circa 2006. The photo is being industriously circulated by the Hillary campaign see Politico piece here. Barack’s funny hat moment posted at the National Examiner on February 4. The photo was originally posted at Hans-Geeska Afrika Online during Barack Obama’s trip home to Kenya in September 2006. U.S. Senator Barack Obama, right, is dressed as a Somali Elder by Sheikh Mahmed Hassan, left, during his visit to Wajir, a rural area in northeastern Kenya, near the borders with Somalia and Ethiopia. The area is at the epicenter of a severe drought that has hit the Horn of Africa region, after erratic and insufficient rains during the April-June season.